In philosophy of mind, epiphenomenalism, also known as ‘Type-E Dualism‘ is a view according to which some or all mental states are mere epiphenomena (side-effects or by-products) of physical states of the world. Thus, epiphenomenalism denies that the mind (as in its states, not its processing) has any influence on the body or any other part of the physical world: while mental states are caused by physical states, mental states do not have any influence on physical states. Some versions of epiphenomenalism claim that all mental states are inert, while others claim that only some mental states are inert. The latter version often claims that only those types of mental states that are especially difficult to account for scientifically are epiphenomenal, such as qualitative mental states (e.g., the sensation of pain). Many Christian theists, on the other hand, insist that mental states are grounded in the soul, which stands in a two-way causal relationship with the body: the soul can influence the body, and the body can influence the soul. This position is also known as substance dualism. 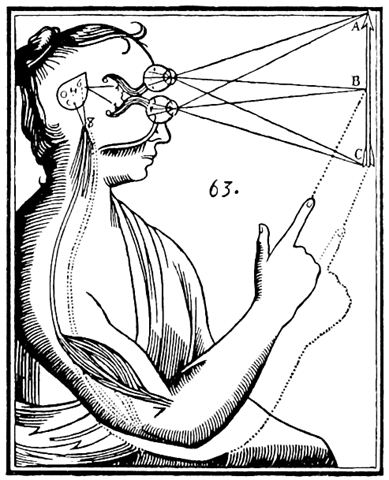 René Descartes‘s illustration of dualism. Inputs are passed on by the sensory organs to the epiphysis in the brain and from there to the immaterial spirit.